Qutub Minar in red and buff sandstone is the highest tower in India and highest brick minaret in the world. Qutub Minar was built in the 13th century, the magnificent tower stands in the Indian capital, Delhi. Qutub Minar has a diameter of 14.32m at the base and about 2.75m on the top with a height of 72.5m. It is an architectural marvel of ancient India. 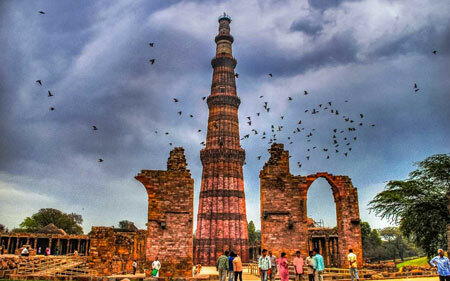 Surrounding the Qutub Minar are many fine historical monuments, a medley of Indo-Islamic artwork. The Outb-Minar and these surrounding structures together are referred as the Qutb complex. History goes like, it was built by Qutub - ud - Din Aibak in 1199. He was a lieutenant in Mohammed Ghauri’s army. Later he built an army and proclaimed himself as independent king. The Qutb - Minar was built as a symbol of his victory over the last Hindu kingdom ruled over Delhi. The structure itself is built over an old Hindu temple. Alaudin-Khilji had an ambitious project in his mind to build a second tower twice as high as the Qutb Minar itself. The construction was on going when he fall sick and died. Its construction thereby ended abruptly when it was about 12 meters tall. The name of this tower is given as Alau Minar and construction of recent studies shows that this structure has been tilted in one direction. The Quwwat-ul-Islam Mosque, the first mosque built in India stands adjacent to the Qutb- Minar. Other important monuments in the Qutb complex includes the gateway built in 1310, the Alai Darwaza, the tombs of Altamish, Ala-ud-din Khaiji and Imam Zamin, the Alai Minar, a 7m high Iron Pillar, etc.